OceanFront 4 bedrooms, 3 bathrooms, living room, kitchen, dining area. MW, DW, W/D, 4 TVs (1 Cable, 4 Roku), Charcoal Grill, WiFi/DSL. POOL PASS @ DAYS INN ASK ABOUT PETS, NO SMOKING. BEDS: 2 King, 1 Queen, 3 Double. Accommodates 10. The house is old but well maintained, everything worked great and we had room for 7 people. Unfortunately, the beach here is badly eroded and disappears at high tide. The granite rock revetment was being reconstructed with larger boulders during our stay. We really enjoyed staying at the Seascape house! The house was spacious and I loved that it was oceanfront. We also loved the shower on the side of the home to get all that wonderful sand off. 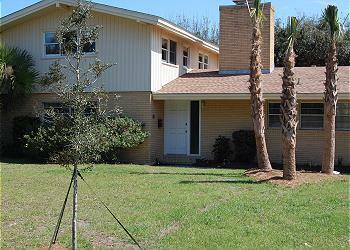 The home was very spacious with large bedrooms and an open concept living area. Although it has not been updated since the 70s (reminded us of the house in the Brady Bunch), the beds were comfortable and we had everything we needed. This could be a super nice house after kitchen and bath remodels! Due to the shoreline damage from recent hurricanes, we could not access the beach from near the house. This was the case along many of the beach access locations. Clean up was going on steadily and the island will recover given time. I just wish we could have had a longer stay to enjoy a bike ride. This was a very last minute rental due to the power outage in the Outer Banks. I spoke with Connie to find a house the night before our arrival, and she was very helpful & professional. Seascape is a very nice place to stay. It is right on the beach and has plenty of space, and everything you need for a wonderful vacation! We had plenty of space for 5 teens, 3 adults and one teen! Loved the upstairs deck for star gazing at night. We had so many deer come right up to the patio every night and we had a great time playing Scattergories around the table! The two bikes really came in handy. Thank you for a lovely vacation! My family of five plus 3 dogs stayed for 33 days! we loved this home and location. It could use some updated (kitchen) but overall it is comfy and would highly recommend. Great location, quiet beach and quiet street.